Women's clothing made from organic cotton, hemp, bamboo, organic wool, organic wool and silk, castor, linseed. The collection includes tunics, long dresses, short dressesfor both the spring / summer and for autumn / winter. Spicy shaped shift long sleeve dress. 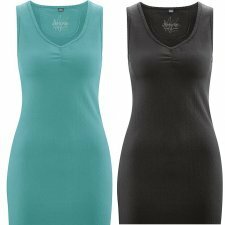 Avalilable colurs: black/nature or water green. Short dress with long sleeves made with hemp and organic cotton. Slim fit. 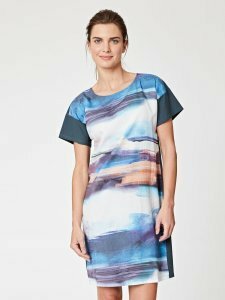 With an exclusively designed print, our Oceanid 100% hemp dress comes in a relaxed fit and features short sleeves, a button fastening at the front and large patch pockets. 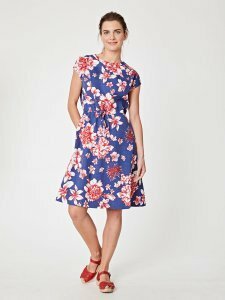 If you're looking for a contemporary, feminine style we think you'll adore one of these unique print dresses. 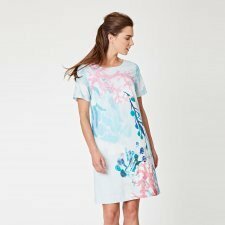 In a soft Tencel and organic cotton fabric, our unique, landscape printed dress features a stunning exclusive design. 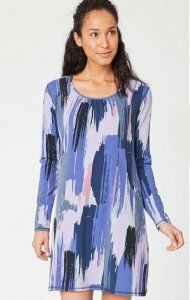 This beautiful Tencel dress comes in a relaxed fit, featuring short raglan sleeves, and a solid colour back falling at the knee. Pair it with flat sandals or trainers for a cool, daytime look. Colours: black, mustard or petrol green. 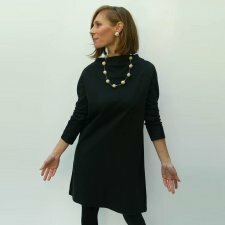 Longshirt "Amy" organic cotton and hemp to wear like a dress or with leggings. 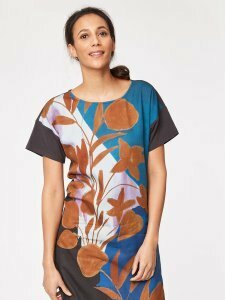 Crafted from a soft tencel fabric and designed to fall just above knee, this all-over painterly leaf piece boasts short sleeves and a soft scoop neckline. Long sleeve maxi shirt/dress made of 100% organic cotton interlock. Colours: black, black cherry or petrol green. Floral flattering skirt with colorful coral print. The waistband of five centimeters with elastic behind makes it extremely comfortable to wear and perfect fit while side pockets are casual. Everything is embellished then by the details of the folds. 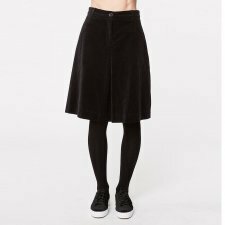 With our signature easy fit waistband, this 100% hemp skirt features functional pockets at the side and an exclusively designed print. 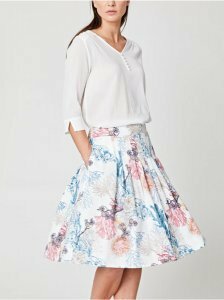 Pair this pleated print skirt with a plain tee or blouse for a daytime look.